Here it is. Proof positive that the Beatles were right. Love really is all there is. 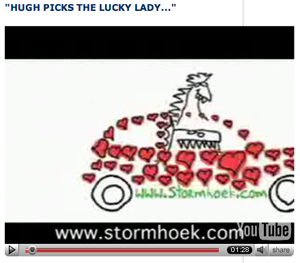 Poor Hugh Macleod embarked on a road tour for Stormhoek Wine, hoping not only to promote the wine, but also to find himself a fair damsel to take away on a romantic weekend in London. And he did. But he’s not her type. You see, she’s a Lesbian. Watch the videos on Hugh’s site and you’ll hear his sad tale and be treated to one of the freshest, most clever, endearing and effective online marketing campaigns ever. Bravo!!! !